The number one target of Real Madrid in the summer of 2017 is Monaco’s Kylian Mbappe, and the striker has given his blessing to a possible transfer. Manchester United and Paris Saint-Germain are interested but if Real pay the asking price, the deal will be done to take the 18-year-old to Spain. There are several factors why Mbappe doesn’t hide a desire to play at the Estadio Santiago Bernabeu. The first, and most important, is the presence of Zinedine Zidane because the coach has had his eye on the player for years, something that the youngster appreciates. Secondly, the project that Real expect Mbappe to play the fullest part in, has seduced him. The sports management of the club have done a complete follow-up of the striker during much of the season, monitoring him from the early stages. He has been highlighted as a threat even when he has not managed to score or his team has been defeated, as they were against Juventus. All those who have come to see him live, have been thrilled by his physical and football attributes. The qualities and determination of Mbappe and the evolution of Zidane’s own staff has determined that the first objective for Real in the summer is to sign the striker. Though he could cost over 100 million euros, the reports on him point to a potentially greater value for his capacity to improve; being only 18 years old and already amongst the footballing elite. Players like Eden Hazard or Paulo Dybala have been placed in the background because of the tremendous impression that Marco Asensio has made. New season, new plans, new football ideas, new roles…even the Antoine Griezmann option has taken a back seat to Mbappe at the moment. The competition for his signing is fierce, with Jose Mourinho knowing that he needs to reinforce an attack that will be without Wayne Rooney after this season. 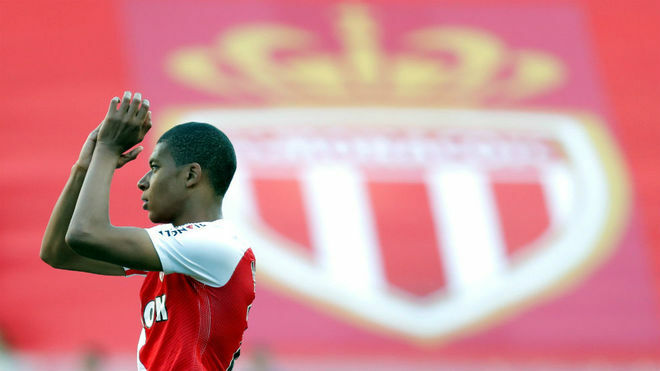 In England, it has been suggested that Monaco have already turned down an offer of 100m euros from the Red Devils, but United will still fight for Mbappe’s signature until it’s an impossibility. Paris Saint-Germain is the other great rival for his signing and in the case of the French team, they also have the option of signing Pierre-Emerick Aubameyang. However, they believe that bagging Mbappe would be a huge statement of intent for French football. If it was purely a financial move, PSG would be the team that would be ahead, but in this particular transfer operation, not everything is going to be about money. Real hold the player in the highest esteem and his priority is to fulfil a dream of playing at the Bernabeu. The president and general manager of the French championship leader, have managed to stabilise the club financially after a few years of uncontrolled spending. After sales and salary control last summer, they don’t have the need to sell and therefore have publicly stated that Mbappe is not for sale. Nor are other stars of the team like Bernardo Silva, Mendy or Lemar. But players know that in Monaco it’s more complicated to reach star status, which they would be able to achieve easier at other teams. Though Real assume that Mbappe could become the most expensive player in their history, that isn’t a problem.